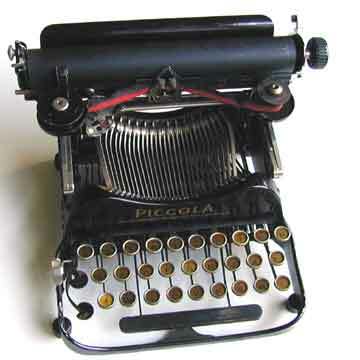 Piccola was the name used by a Berlin company to market the earliest version of the folding Corona 3 on the German market. Only very few of the machines were sold and this variant of an otherwise common machine is extremely rare. The first Piccola that was advertised had the shape of the earlier Standard Folding (see Standard Folding). These advertisements appeared shortly after the Swiss general dealer of the Standard, Mueller in Zurich, stopped advertising a stock of 400 machines that it wanted to sell. This stock may well have been the beginning of the Piccola company. 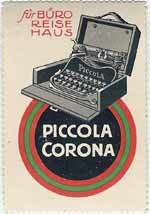 Soon after, the first ads for the Piccola with the shape of the Corona 3 appeared. This was in fact the very first model of the Corona 3, with pivot bearing type bars (see pic 5). The machine also had a very simple, plain shift key (see pic 6). Serial numbers on the Piccola were part of the general Corona series, that in turn had started with the Standard Folding. The first Corona 3 was long thought to have had a number close to 20,000. However, the Piccola presented here has serial number 14,299 and even earlier Corona 3s are known. It is now believed that the switch from Folding Standard to Corona was made somewhere between 12,000 and 13,500.